I don’t take credit for this insanity, I was inspired by the amazing Picky Palate. After the Justin Bieber concert yesterday (yes, I went, so what? It was amazing!) the adrenaline was still pumping too hard for me to be able to go to sleep. The screams of the teenage girls who filled the stadium were still echoing in my head and I felt the need to BAKE. I wanted to bake something epic to fit my mood, and I wanted to sing and dance to Justin Bieber songs while I did it. So since I also had this early morning meeting today, and I’ve been promising a colleague that I would bake these Inception Cookies for him for a while now, I figured… why the hell not? Which is probably the very same reasoning behind the inception of this recipe. 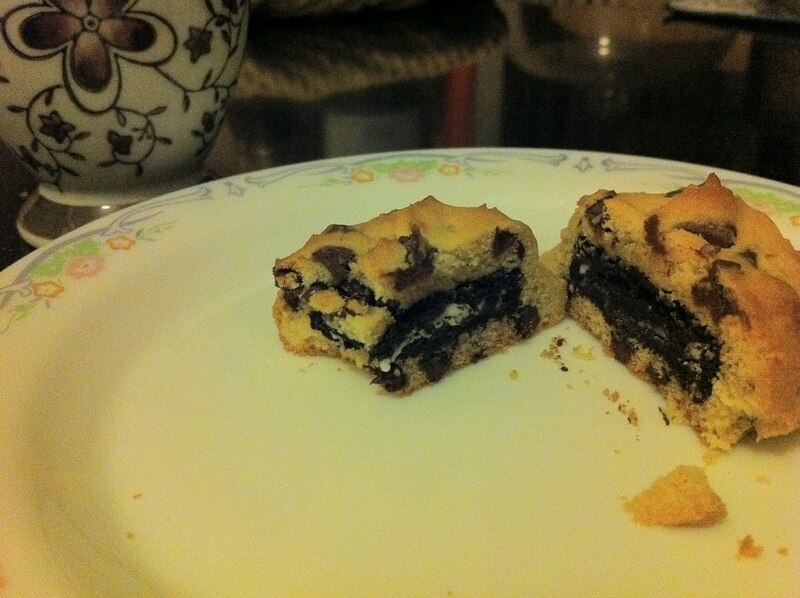 Put an Oreo in a chocolate chip cookie? The recipe is easy enough, but since I didn’t have Picky Palate’s recipe on me, I just used my go-to chocolate chip cookie recipe and threw in an Oreo. Note that I only mixed in ONE cup of chocolate chips for this batch though, considering there’s an Oreo smack dab in the midst of it, we could do without as many chips.